We need to give our work to the machines. The economy is in between gears right now, and that’s a growing problem because as is true with all higher gears, we could be accomplishing so much more with so much less and prosperity could be greatly increased for not only the lucky few, but everyone. What do I mean? Well, let’s look at the gears of capitalism, of which there have so far been three, before moving on to what fourth gear is, what’s stopping us from it, and how we can achieve it. First gear was made possible by the invention of the steam engine, which allowed for the beginnings of industry and the bridging of great distances with trains and steam-powered ships. Second gear was made possible by the invention of electricity, which allowed for industrialization to go into overdrive while bridging even greater distances with the telegraph and telephones. Third gear was made possible by the invention of the computer, which allowed for full globalization and the connection of everyone to each other all over the world with information technology and the internet. So what is fourth gear? Fourth gear is the handing over of labor to machines, and that does not only include muscle labor as was already true in lower gears, but mental labor. It is the long-awaited freeing of humanity to pursue human interests, paid or unpaid, as payment is of less concern when machines are working for us…that is as long as we humans are earning the machines’ paychecks to purchase what they’re producing. And that’s the rub. That’s why we’ve so far refused to shift into fourth gear capitalism, because in fourth gear, human labor necessarily becomes unnecessary. This can be an obstacle within the mind, for capitalism itself was built to combat scarcity, and the division of labor meant everyone need pull their weight so that all may survive. But each gear along the way has enabled us to do more with less energy expended, so where once a majority of humanity’s time was spent in the fields, now about one percent is. Where once we worked 3,000 hours per year on average in the U.S. in the late 19th century, we now work 1,900 hours per year here in the early 21st century. This has always been the direction of our ultimate aim, to leverage technology so as to work less, so that we can as humans live more. And yet we are now stymieing ourselves. In the mid 1980s, we actually began working more, after reaching a low of around 1,800 hours per year. Why are we working 100 hours more per year in the U.S. despite productivity doubling in that same period of time? Known now as the Great Decoupling, our productivity entirely detached from our earned incomes in the mid 1970s, skyrocketing upwards with the advance of technology while the great majority was left behind. 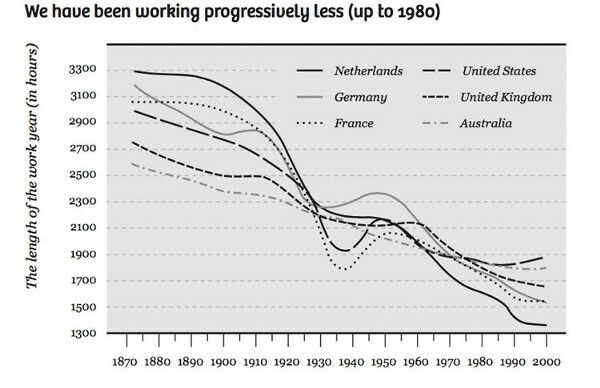 Where all incomes once rose with productivity, now only the incomes of those at the top do. For the rest, there is instead an increasingly dangerous cocktail of growing inequality, falling security, increasing precariousness, and an anger whose source can’t quite be pinpointed. What’s going on? How can capitalism have created so much abundance that there are now even digital goods of zero scarcity due to infinite supply, and the entire planet is a global marketplace for goods and services, and robots are building our cars and phones, and software is providing an increasing number of services, yet capitalism itself can be argued as being responsible for actually eroding the middle class lives of hundreds of millions all over the world? 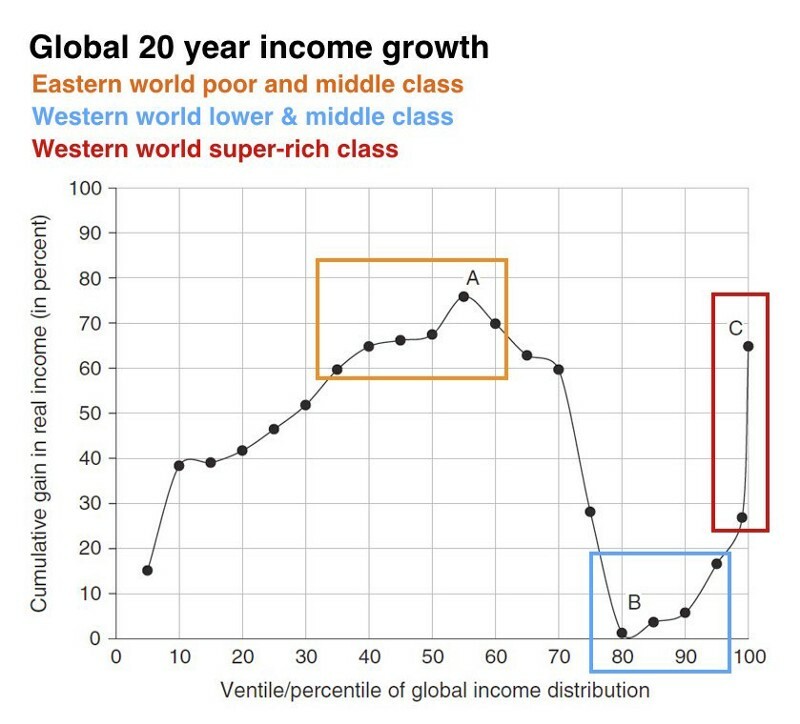 What’s going on when technology is growing at an exponential rate and yet 70 percent of households in 25 advanced economies saw their earnings drop this century? What’s going on is that we’ve conquered scarcity and yet have refused to acknowledge it. As William Gibson has said, “The future is already here — it’s just not very evenly distributed.” Our world no longer physically requires everyone to work so as to successfully meet everyone’s daily demand for basic goods and services, and yet it does still require the spending of money to acquire those goods and services. Markets require money and people, and yet money isn’t getting to people. There is thus a wrench in the machinery of our own making. Just as in any manual transmission car, shifting gears requires pushing in the clutch to disengage the current gear, and whereas that’s usually something we must decide to do, in our case, technology has made that decision for us. Technology has its foot on the clutch and so here we are in a global economy that is paradoxically slowing down, despite our being surrounded by more amazing technology at this moment than at any moment in human history. Do we provide money to all unconditionally and even index it to productivity growth so that everyone can forever purchase what the machines are producing? Or do we continue to insist that money must be earned with human labor despite existing in a world where human labor will be increasingly out-competed by machines and robots don’t buy anything? Fourth gear capitalism is not even the great unknown we think it is. We’ve actually seen glimpses of it in action. We’ve seen it in Namibia where money was provided to all unconditionally and entrepreneurship tripled, thanks to increased abilities of both producers to produce and consumers to consume. 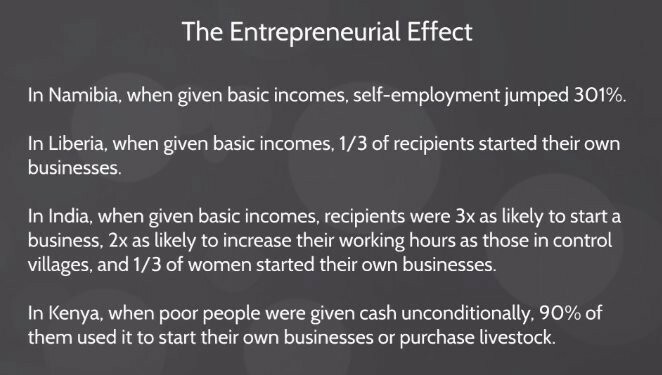 We’ve seen it in India where money was provided to all unconditionally and entrepreneurship tripled compared to control groups. We’ve seen it in Kenya and Uganda thanks to the charity Liberia. F. A. Hayek himself knew this. Milton Friedman knew this. Both advocated free markets. Both advocated basic income. Why? Because markets require everyone has at least some money in order to participate in them. A market full of customers without cash is like a democracy full of citizens without the right to vote. We even see beyond capitalism itself every time someone with the time and resources to do so, spends their time contributing pages to Wikipedia or open source code to GitHub for no money in return. We see it in video after video on YouTube, shared with the world for free, created by those with the time and resources to create what they wanted to create for the sake of creation. We see it whenever any scientist or inventor pours their time and resources into the next great discovery, not to get rich, but to peel back the layers of reality to show what is and what might be. 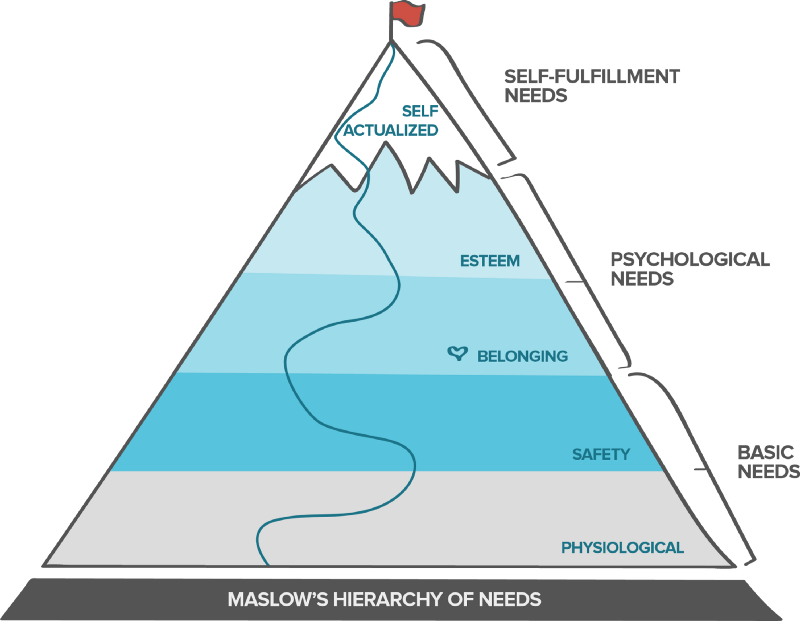 This is the power of intrinsic motivation in action, and Maslow’s Hierarchy of Needs where once one’s most basic needs are met, one’s focus shifts towards meeting higher needs like social relationships, creativity, learning, and personal achievement. The removal of the daily burden of chasing survival creates an abundance of new potential within the mind, and when that happens, scarcity — humanity’s oldest enemy — is soundly defeated. No longer weighed down by scarcity, the mind shifts towards long-term thinking, and it’s even comparable to a gain of 14 IQ points. Imagine what’s possible when that happens to billions of people. No one stops at levels 1-2 by choice. Suicide is even a response to being stuck there. The ultimate goal for all is the top. We simply no longer live in a world of immutable scarcity. We live in a world of maldistributed abundance. The first three gears of capitalism made that possible. But shifting into capitalism’s fourth gear must yet be done and it must be done manually. It will not be done for us. It’s a collective decision, and just like any collective decision, it is best done democratically, not passed down from up on high, but voted up from below. We can even use our newest technologies like the internet, and smartphones, and software to empower us in inventive new ways to finally grasp that great lever of capitalism and pull it together. And with that then accomplished, fifth gear finally becomes possible — postcapitalism — the great undiscovered country of human civilization. It is for this reason I invite you all to do your part in engaging in this collective decision and many more. Become part of the changes like universal basic income and universal health care that need to be made. Lend your voice. Lend your time. Lend your passion. Connect with each other. Connect with your representatives. Connect with ideas. Be a part of the cultural shifting of gears we need to make here in the 21st century. Be a part of humanity, and of your communities. Engage and together we can move the world forward. Next Year, a Californian City Will Launch the First Basic Income Experiment in the U.S.
Is Technology Really Going to Destroy More Jobs Than Ever Before?